Story by Mia Uhunmwuangho The 27 acres of land just east of U.S. Route 183 look just like any other patch of open land in Texas. The grass is a faded green and overgrown with shrubbery, patches of moss cling to the trees and only birds and insects call this place home. The thousands of drivers who pass by it everyday easily overlook it. But, when Nate Schleueter and the rest of the Mobile Loaves & Fishes team look into this field, they see a vision, one that will revolutionize how communities deal with chronic homelessness. Mobile Loaves & Fishes is a nonprofit organization in Austin that has been around for more than 16 years. The organization specializes in services that help homeless people find work and permanent housing. Nate Schleuter is the director of one of these services, the ROADS Micro-Enterprise program, which has employed over one hundred homeless people since it’s start. But now, Schleueter also serves as Community Relations Director for the organization’s most ambitious project, the Community First! Village, which formally broke ground on August 27, 2014. The Community First! 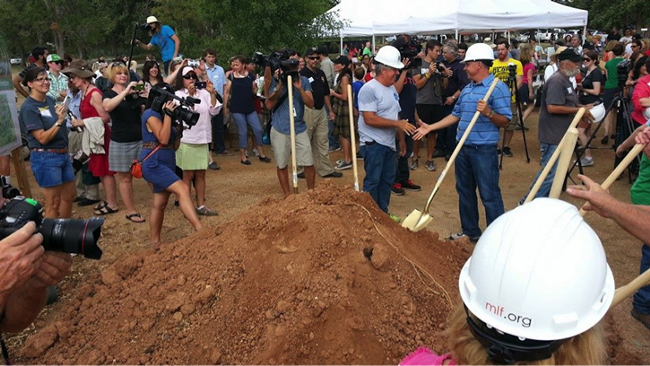 Village, which has been in the works for the past 10 years, is a 27-acre community that will provide permanent and affordable housing for homeless people throughout Austin and Central Texas. The community will include housing, a garden, walking trails, an outdoor theater, a medical facility for physical and mental health screenings and other services. Schleueter notes that these amenities will be provided because the community is meant to be a place of permanence, unlike most homeless shelters, which require homeless people to move in and out. “As long as you pay rent, you can stay. We provide work opportunities through workshops and art galleries so these homeless people can earn a dignified living. It’s not transitional housing,” Schleueter says. The term “tiny house,” or“micro-home,” is used to refer to homes that are 100- to 400-square-feet in size. 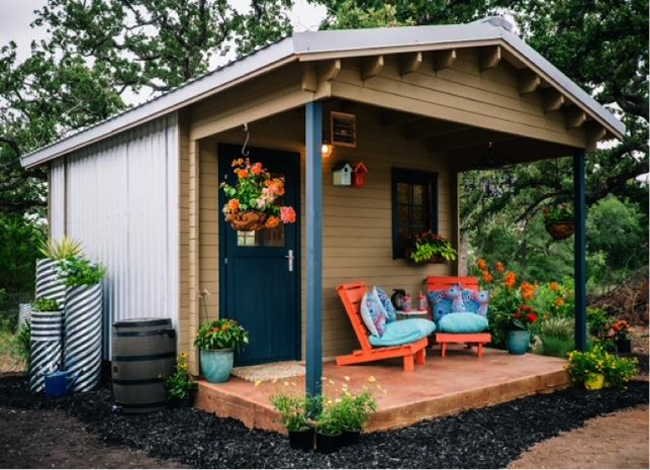 While it’s difficult to imagine living in a space 25 times smaller than the average 2,600-square-foot American home, the tiny house movement has been garnering a large increase in momentum. These homes have become a symbol of a life of simplicity, as most people who downgrade to these smaller homes are looking to save money, decrease their environmental footprint or just transition into a lifestyle with just the bare necessities. The organization is giving the symbol a new meaning by using tiny homes as a means of housing the chronically homeless in the village. The compact size of the tiny houses makes them perfect for housing a homeless community. The homes in the Community First! Village will range from 144-square-feet to 180-square-feet. Though the homes are small in size, the standard of living will not be decreased. Each home will come equipped with Wi-Fi, electricity, an outdoor kitchen and a private bathroom. Schleueter says this innovative idea first came around years ago when the organization originally used RVs. “We could lift people off the streets if we could provide them with an RV and place them in an RV park. It’s the same idea with these tiny houses," Schleueter says. The homes are also designed to be environmentally friendly and sustainable. Using small rooms, instead of larger rooms, maximizes airflow, which reduces the need for excessive power usage. What’s even more remarkable is that each of these homes only takes six hours to build. Plus, once they’re built, each home is painted a bright color and given a patio with chairs and plants, all of which help to create a homey feel. While the community sounds ideal, there’s a hefty price tag on innovation. Each of these tiny homes will cost Mobile Loaves & Fishes about $20,000 to build. This puts the organization’s total expenses, including the amenities and other housing options, at $12 million. Right now, more than $7 million have been raised, and Schleueter and the rest of the team hope the remaining $4 million will be raised within the coming months. The first residents of the village are set to arrive in the spring, and after that, growth will occur incrementally. Mobile Loaves & Fishes Donor Relations Director Donna Emery estimates that the community will reach its full capacity in 18 months. Money is not the only obstacle the Community First! Village will be facing. Dr. Calvin Streeter, a social work professor at UT and board member on Austin’s Ending Chronic Homelessness Coalition, says the public’s reaction could pose as a potential issue. “With any project like this, there’s going to be negative reactions. Part of that negative reaction stems from the ‘not in my backyard, we don’t want it close to us’ kind of thing,” Streeter says.